Spartans celebrate a successful winter sports season with daily themes and activities. Coming off of a much needed two-week break for the holidays, the TJ community is right back into the groove of things. The leadership class has been hard at work preparing a festive week for students to celebrate their many sports teams that have been hard at work as well as display their school spirit. TJ’s athletes have been performing very well this winter season. The girls’ basketball team sits at 9-8, and hopes to make some noise in their next few league games against DPS rivals. The boys’ basketball team sports an impressive 12-7 record and looks to claim the Denver Public League title over the course of their next four games. The wrestling team placed 17th out of 87 other teams at the Northern Colorado Christmas Tournament and they hope to make a run in the playoffs again this year. The girls’ swim team has had a great season and they out-performed Colorado Academy, Denver North, Englewood, and Northfield at their meets. To start the week off right, Spartans get to show off their acting skills with Meme Monday, highlighting the students who have far too much time on their hands. Following that, students will be able to relive their glory days with Toddler Tuesday, and perhaps teachers will permit naps to add to the theme… On Wednesday, Spartans will be given the opportunity to wear a hat or piece of headgear in exchange for one dollar which will be donated to the Senior class’ prom fund. Thursday is all about repping your favorite team by rocking their jersey to school, with Jersey Day, but try to avoid wearing a Warriors jersey as that will not go over well in Nuggets country. 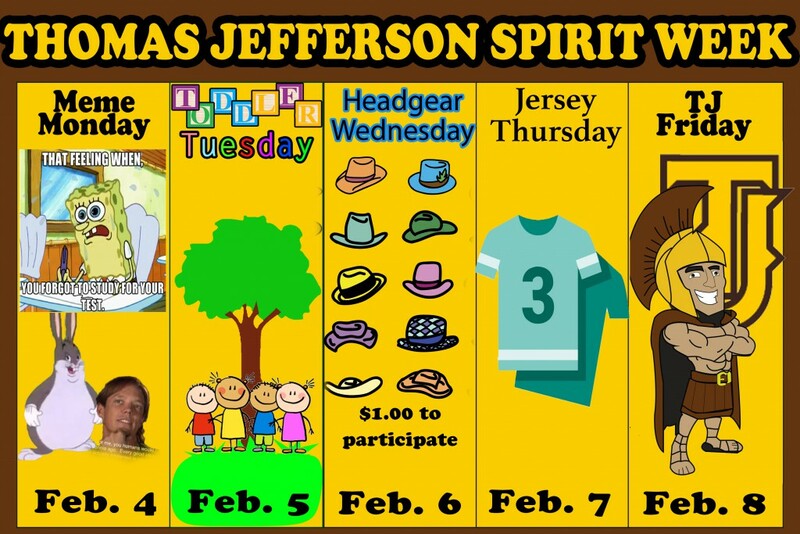 And lastly, Friday will be TJ Day and Spartans are encouraged to dress up and show up to the pep rally at the end of the day in preparation for a home game showdown with the East Angels. The girls’ game starts at 5:30 p.m., followed by the boys’ game at 7:00 p.m.. The TJ community is one that takes pride in its spirit, and this week will certainly be one to remember.